At the end of the week-long event and in front of a full house, the 30th Annual Hillsborough County Schools’ Tony Saladino High School Baseball Tournament championship game welcomed the Alonso Ravens and the Plant Panthers to Brandon’s Don Powell Field.For the Panthers, reaching the finals was a huge accomplishment, according to Head Coach Dennis Braun.“Some may say that we had a slow start, but I say we did not play poorly,” Braun said. “We stayed the course, and that is why we are here today.”As for Alonso, the 6-1 championship win was much sweeter. 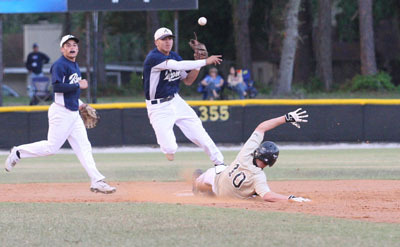 Led by senior left-handed pitcher Brandon Johnson, who held Plant at bay by just one run while striking out six in as many innings, the Ravens have now joined Bloomingdale (1994-95) and Sickles (2001-02) in becoming repeat champions, defending their 2009 Saladino title.While area programs like Newsome, Riverview, East Bay, Durant and Spoto were eliminated in the first round, the Brandon Eagles managed to reach the semifinals but were halted by Plant. The tournament’s final day spurred some other winners as well, including Home Run Derby champion Zack Powers. The Armwood High School senior hit three third-round home runs for the title. As for the traditional Saladino scholarship, it went to Alonso graduate Adam Pendleton, who now attends the University of Tampa, having received $5,000.The biggest winners once again were the members of the Saladino family comprised of tournament hosts, Tony, 75, and Bertha, 78. Their undeniable love for the game and the young athletes, coupled with Bertha’s Kitchen which so abundantly serves coaches, players, umpires, scouts, volunteers and the media, has become legendary.For many, the event has been and will always prove to be the highlight of spring break with the regret that all participants now must wait another year to join the festivities once more.For more information about the Saladino Baseball Tournament, please visit www.saladinobaseballtournament.com.